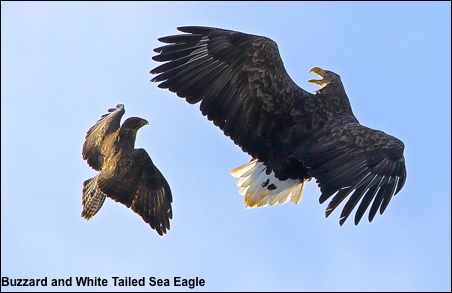 Last week on Islay was highlighted with a mid-air conflict between a Buzzard and an adult Sea Eagle. The Eagle had strayed into the breeding territory of the Buzzard and despite being only a third the size of the Eagle it fearlessly attacked and drove it off! The forest where the above encounter took place had a heavy crop of cones and Crossbills were breeding with at least one fledged young being seen. Some photos were taken of the Crossbills eating lichen on trees and a wall – see gallery.